« Nepotism In Family Businesses Good Or Bad? Published on December 13, 2011 in Business Growth, Direct Mail, Exponential Marketing, Internet Strategies, Lead Generation, Marketing Mistakes To Avoid and Sales. 0 Comments Tags: Direct Mail, Print Advertising, Print Media Statistics. I was just talking with a print publisher explaining to her that I am a firm believer in the immense value of print media – EVEN if we are in a digital age, we are still not about to forego print anytime soon. Print just has to COMPLEMENT digital capabilities. Both print and digital can and SHOULD co-exist at least for another 5 years (if not a lot longer). If we look at email versus direct mail, you’d think the physical mailing would be on its way out, but there has been a resurgence of direct mail BECAUSE of the overload of electronic media. Most people sign up for every email subscription and don’t manage their inbox very well. Recent research estimates the number of emails sent per day to be around 294 billion which means more than 2.8 million emails are sent every second and some 90 trillion emails are sent per year. Even though most are spam and viruses, emails are sent by around 2.5 billion genuine email users. Regardless of the Internet Statistics, they all point to electronic information overload with the average professional receiving more than 100 e-mails every day. That’s enough to load up your inbox quicker than you can clean it out. That’s why the physical mailing has not only become an attractive alternative to email and online marketing, but a source of pre-screened and highly qualified visitors. 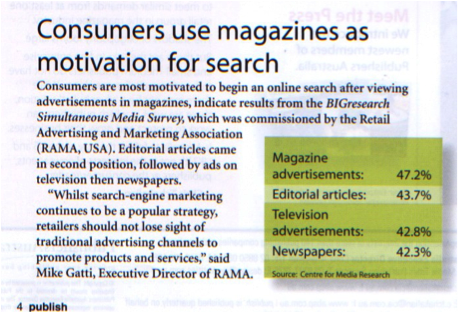 The Retail Advertising and Marketing Association (RAMA, USA) report that consumers are most motivated to begin an online search after viewing advertisements in magazines followed by ads on television and then newspapers. Nothing beats having a newspaper, magazine or book in hand. I totally understand the sexiness of an iPad, but it’s NOT the same experience. It’s a DIFFERENT ONE. That’s the point I’m trying to make. Print is print is print. When publishers forget that, the game is over. So what is a print publisher to do? Embrace digital technology to complement, supplement and enhance the print medium with additional features and benefits. Link the print medium to online alternatives with polls, surveys, feedback, audio and video components. A print article can easily be an introduction to a full in-depth interview or book chapter available online as an opt-in download. Print-exclusive promotions such as tear-out coupons (identified as such) can bolster subscriptions and/or increase distribution. Physical distribution costs can be shared with partners who have a vested interest in the publication’s increased reach. 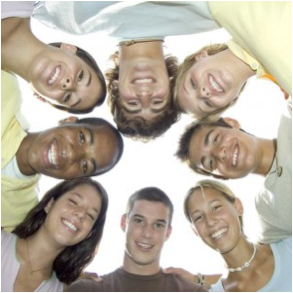 Want to know more ideas and suggestions, contact us – it’s what we do for our clients! A recent study showed that about 8 in 10 Canadians read a newspaper each week with American weekly and British daily readership at 64 and 49% respectively. Magazines Canada reports that magazines are read by all age groups, and an average of 78 % read a magazine within the last 30 days. An analysis by the Magazine Media Fact Book reveals American magazine reading habits include 93% of adults reading magazines for an average of 42 minutes per issue. If you think it’s only the senior demographic that is holding on to physical print media, you’re dead wrong! A recent study discovered that North American consumers, aged 18-34, prefer direct mail over online media for many types of marketing communications. But there’s a condition for the young generation to hold on to traditional print media.it’s vital that there be a cross-channel synergy between digital and direct mail for it to be effective. So there you have it, if you want to get more sales in 2012, you need to go back to traditional offline marketing and leverage it with online ‘web enabled’ benefits.